Middle market companies have great stories to tell. Those stories can help promote their brand, recruit top talent and build a return with purpose in their communities. Recruiting great talent is at the forefront of middle market companies, says Doug Farren, managing director, National Center for the Middle Market based on the campus of Ohio State University. Prior to 1914, Farren said middle market companies were most concerned about health care. Now, their biggest challenge is recruiting and retaining talent. “When there are job fairs at Ohio State, students line up to speak to large companies, like Google, Nike and others. That’s because they already feel a connection to the brand,” said Farren to a group of about 150 at a recent event sponsored by the Chicagoland Chamber of Commerce. Middle market companies need to build their brand, and they can do so in creative ways. Farren says a company in Albany, N.Y., holds a car show each year on its site and invites college students to attend. “Then they bring them inside their facility,” and tell them their story, said Farren. Aside from growing their brand awareness, middle market companies are showing solid performance based on a survey summarizing 2018 growth and predictions for 2019. The survey was conducted with 1,000 C-suite executives (about one quarter of whom are from Chicago) with companies that have annual revenue growth between $10 million and $1 billion. · Revenue growth was up 7.2% in Chicago, compared to 7.9% in the Midwest and 8.1% nationally. · Employment growth increased 4.5% in Chicago in 2018, compared to 5.5% in the Midwest and 6.3% nationally. · Chicago economic confidence is up to 82%, compared to 76% in 2017. Because Chicago has a high manufacturing density, concerns of tariffs and export markets may have impacted the confidence number, said Thomas Stewart, executive director of the National Center for the Middle Market. 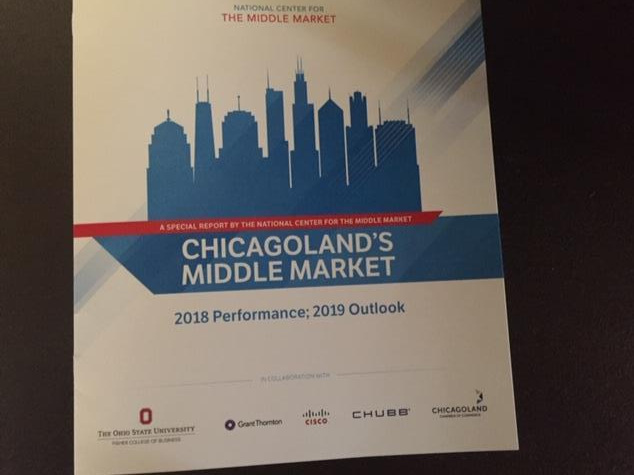 · 2019 revenue growth is projected to be 5.5%, compared to 4.5% in the Midwest and 5.8% nationally. · Employment growth this year in Chicago is projected to grow 3.4%, compared to 4.1% in the Midwest and 4.5% nationally. Companies have an opportunity to tell their stories – internally to promote culture and externally to build brand awareness. Roderick Kelly is co-founder of K+L Storytellers, a corporate storytelling firm for culture-driven, middle market companies.